It is very en vogue to say that the E.T. 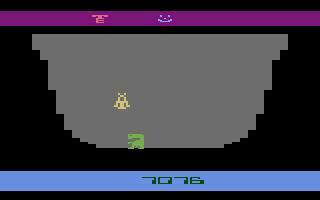 The Extra Terrestrial game for the Atari 2600 was one of the worst games ever created. Statements are casually thrown around concerning this game, such as “It contributed to the downfall of Atari”. Its reputation is legendary in that it is rumored that Atari took the thousands of unsold cartridges and buried them in the desert. However, I have always had a soft spot in my heart for this particular game. It could be that my rose-colored contact lenses might be preventing me from judging the full amount of suckiness that exists within this game, but I don’t think so. In my opinion, this game is fun. Yes, you read that right. I have played E.T. countless times, and although like any other game I grow tired of it after a while, I am always drawn back to it. Let me try to point out what is so great about this game. 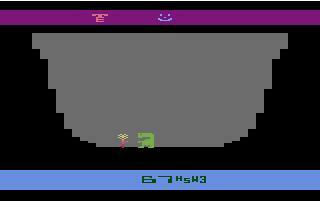 However, the complexity of the game comes from the random placement of the three pieces of E.T.’s interplanetary phone, as well as the seven Power Zones. This forces you to explore the maps not only searching for the location of the interplanetary phone pieces, but also for the spot where you can hail the mothership to return you to your planet, and even the exact landing site where the ship will pick you up. This random placement of phone pieces and power zones imbued the game with limitless replayability, which is more than can be said for some Atari “classics”. Like many Atari games, E.T. had an adjustable difficulty level. Novices could prevent the FBI Agent and the Scientist from ever appearing. Experienced players could choose to fend off the meddling Scientist, but remove the FBI Agent from the equations. Seasoned veterans could increase the difficulty by taking on both of the FBI Agent and the Scientist. The FBI Agent was the most dangerous enemy in the game, as he could take away your interplanetary phone pieces with no warning. Masters of the game could increase the difficulty even more by speeding up the enemy humans, as well as preventing the mothership from appearing if Elliott is in the forest. Many detractors say that the game is too hard, and that one of the game mechanics (falling into wells to look for pieces of ET’s interplanetary telephone) is too complicated and repetitive. To those detractors I say this: you are wrong. Certainly, navigating through the screens (and especially in and out of the wells) takes some practice in order to master, but as with many other things in life, you get out of it what you put into it. This was not a traditional “plug and play” Atari game where you just popped the cartridge into the VCS and tried to figure out the game. You HAD to read the manual in order to have any idea of what was going on. Atari even threw in a tip sheet with the game to make it easier for those playing the game. This was not a problem for me, because even as a child I was a devoted instruction manual reader. I would always read the instruction manual before turning the game on (something that drove my family and friends crazy when we got a new game to play). 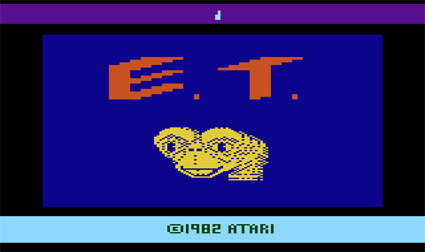 The graphics on E.T. were surprisingly good for an Atari game. The splash screen when you first turned on the game was pretty amazing at the time. How could you not love that face? How could you not want to spend entire afternoons of your childhood helping him find the pieces of his phone over and over again? The music over the opening screen were also quite good for an Atari game. Not many people know that the E.T. game contained some Easter Eggs (hidden items in the game that only a specific series of events would unlock). All of the Easter Eggs centered on the flower hidden in one of the wells. The flower was a bit of an Easter Egg all by itself. You didn’t need to find the flower to win the game, but if you did find the flower, and bring it back to life using your mysterious alien powers, Elliott was capable of saving your life four times instead of the traditional three (consider it E.T’s green 1-UP mushroom). 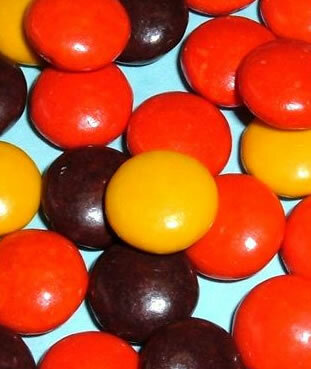 However, if you collect seven Reeses Pieces (no more, no less) and give them to Elliott, then collect all three phone pieces, then locate and revive the flower, the flower will turn into Yar from Yar’s Revenge and fly away. If you win the game, then do this again, the flower will turn into Indiana Jones from Raiders of the Lost Ark. If you do this a third time, the programmer’s initials (Howard Scott Warshaw) will appear at the bottom of the screen. He programmed Yar’s Revenge and Raiders of the Lost Ark, which explains the other Easter Eggs. E.T. was his third game (hence the 3). Did E.T. Cause Atari to Fail? The short answer is “No”. The long answer is a little more complicated, but not by much. 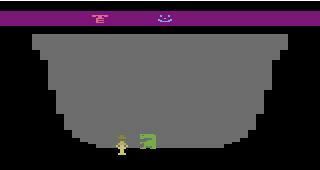 According to video game lore, Atari wanted to impress both Spielberg and the American public with this game. However, they also wanted it available for the Christmas shopping season. As a result, the programmer only had a little over five weeks to complete the game. Personally, I think the programmer did a great job with the task he was given. Sure, the game isn’t as polished as it might have been, but it is still pretty darn good. Atari’s hubris was the cause of their downfall. E.T. was just the fall guy. First, Atari paid an enormous amount for the right to make the game (reportedly $20-$25 million – an obscene amount of money at the time). Next, Atari skipped user testing in order to get the game out early enough for the Christmas rush. In addition, Atari forced retailers to place their orders in advance for the entire year, causing the retailers to initially over-order the title, and then hit Atari with a large amount of cancellations. It is hard to blame E.T. for Atari’s demise. It is the #8 best-selling Atari cartridge of all time, selling more than 1.5 million copies. However, Atari was so sure that E.T. would be a hit, they made an estimated 4 million cartridges. It was this financial blunder and bad business on Atari’s part that led to their downfall. I hope I have changed some minds with this article. If you have bad memories of the E.T. game from your childhood, I encourage you to give the game another try. You might be surprised at how much you enjoy this little game.